James “Rhio” O’Connor’s diagnosis is one that so many of us can relate to, whether through a close family member, a friend, or one’s own experience. Everyone left behind has a story to tell, and I’m no exception. When I was small, my great-grandfather—an artist, like myself, and unlike me a chain smoker—died of lung cancer. Four years ago, his son (my grandfather) came to the US to get treated for lymph node cancer (also known as Hodgkin’s disease). My family watched him shrivel into a shadow of his former self while being treated with chemotherapy and a barrage of pills at one of the best cancer hospitals in the country, only to die three weeks later. My great-grandmother had breast cancer, beat it, and is now facing its return—this time, at 92, is probably her last. A friend of mine from high school, facing a dire cancer prognosis, decided to stay home with his family instead of going to college with the rest of our class. He hung up his tennis racket and dreams of “going pro” and instead took his mother, father, and sister to go see Shanghai with the Make a Wish Foundation. Yesterday, he died. There’s no way to describe it—my friend, the young man I knew and laughed with and grew up with for 6 years—he’s gone forever. His death and our loss are so keenly felt. I write this essay for Alex and for the vibrancy with which he lived every day of his tragically short life, even while constantly facing the certainty of death. Unlike most illnesses that are well understood, scientifically explained, and systematically treated in an effective manner, cancer continuously eludes efforts to fully explicate and eradicate it. It highlights our fragile nature and smallness compared to the power and vastness of Nature. It reminds us of mystery—the edges of the map, the chimeras and dragons drawn in the middle of the unknown—that still dogs this scientifically demarcated world. Most importantly, cancer robs us of that basic right we hold so dear: freedom, especially the freedom to choose. The greatest fear with cancer, and death in general, is being stripped of all control, all human dignity, and being forced to journey into the dark unknown. I’ve asked myself before what I would do facing a diagnosis of cancer. It’s a question that strikes close to home, not only because of loved ones lost but also because of my own condition: Trevor’s Disease, which is manifested as extra growth of bone in the knees and ankles that chronically inhibits movement. It was supposed to confine me to a wheelchair for the rest of my life, but thanks to the prayers of my parents, I was spared the usual course of the disease. However, the growths makes high-impact activities such as running, jumping, and most athletic pursuits impossible and, according to the doctors, will give me arthritis by the time I’m 45. It’s not a one-year sentence, but my experience with Trevor’s Disease allows me to give a very accurate description of what I would do if facing a terminal illness such as cancer by recounting how I’ve dealt with my own disease. During high school, I endured 3 operations—one a year during the summer, and then additional procedures afterwards when the last surgery did not go as planned. Each time, the doctors concocted a new plan to “fix” my problem, and each time I’d last six months and then find myself in pain again. The operations were so difficult by themselves: I had to make the choice to have the procedure done, endure the hospital experience that terrifies me to this day (when it comes to IVs, practice does not make perfect), and then return to school on steroids and painkillers, crutches, and eventually a wheelchair as well. When the operation didn’t achieve the objective, I’d give it another try and agree to return; I didn’t want to give up or, even worse, give in. The failure of every successive procedure was a possibility foreseen by doctors, but to me it was devastatingly frustrating. I hinged my hopes on the surgery; each needle and each procedure was a step closer to dancing, to skating, to running, to being normal. And each time, my hopes were dashed. Now that I’m in college, there’s simply no time for the lengthy recovery and daily hours of rehabilitation necessary for another surgery, and I can’t afford to be slightly delirious during class from painkillers. I had decided to ignore my issue and simply minimize mobility. If I denied the pain and just walked less, I’d put off another hospital stay—a short-term and possibly detrimental “solution” that I was perfectly aware was making the issue worse. My reasoning was that if I ignored the problem, I’d be asserting the most control I had over the situation—a farce that I clung to in order to live with the constant pain and looming threat of surgery and arthritis. Then I read James Rhio O’Connor’s story. He was given one answer and handed one solution, but he refused to take either. One year, he decided, was not long enough. He took responsibility for his own life, denying cancer the chance to strip away his power to choose. By becoming deeply involved with the fight to save his own life and becoming proactive in his interactions with doctors, his lifestyle, and his treatment options, he managed to outlive the doctors’ estimations by six years. In addition, by “going public” with his book, They Said Months. I Chose Years!, O’Connor gave hope and a better alternative to others who found themselves in his situation, not only creating for himself another chance at life but leaving a legacy, and doing so with years of his life that doctors didn’t even think that he would have. In his book, O’Connor relates his diagnosis with mesothelioma. He narrates how he fearlessly challenged conventional Western medicine even at its most basic level of, on principle, treating the symptom instead of treating the disease, which he lists as the main difference between Eastern and Western medicine. His in-depth study of every aspect of medicine—its philosophy, economics, science, biases and even bureaucracy—is related here in such a straight-forward, unassuming fashion. O’Connor not only makes stigmatized, “risky”, “alternative” treatments appear commonplace but also presents himself as taking the logical path towards recovery from cancer; after reading his book, it would seem like every patient with cancer would naturally discover the cancer-fighting utility of “fenugreek” (O’Connor 48) (typically used for increased breast milk production), “Eicosapentaenoic acid” (25) (a type of Omega-3 acid), and even “Bok Choy” (53) (the potassium in this cabbage lowers blood pressure and contains phytonutrients thought to prevent cancer) rather than submit to chemotherapy and a painful passage into the next world. His staunch refusal to give in to cancer and his courageous fight in the face of a previously mysterious, unknown adversary are strong testaments to his character as well as his service in the Marine Corps and dedication to his wife, Arlene. His fight—and especially his victory—over mesothelioma is a rallying cry to every patient diagnosed with terminal and supposedly incurable diseases. It is important to accept that these afflictions cannot always be chased away by even the most dedicated individual. However, taking ownership of one’s illness is a much more effective way of controlling one’s own life than simply ignoring an issue. 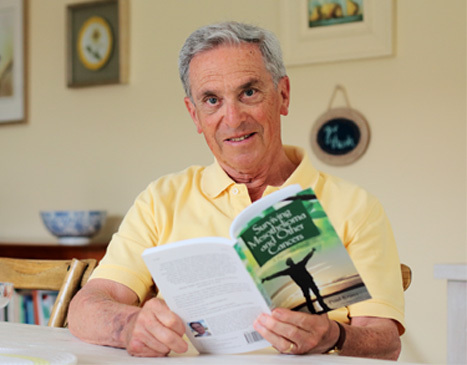 J. R. O’Connor’s success story has given me inspiration to take responsibility for my own health and his book is a testament to the huge difference this can make in my life. I will choose not to hide from but to face and to fight Trevor’s Disease, knowing the real possibility of success that has proved so elusive with conventional methods. And to those with cancer, O’Connor gave another option: to fight with dignity for freedom, for choice, and for a meaningful life, despite dire diagnoses. His life, not his death, is what he is remembered for. And everyone can learn from his words, “There is always a tomorrow, but never a yesterday. You cannot change the past, but you can always use what you learned in the past to make better decisions now” (9). You can learn more about James Rhio O’Connor at https://survivingmesothelioma.com/rhiooconnor.cfm.